In this fast pace world, things are very complex. The rich has more resources and the idea of ‘might is right’ goes everywhere. There are less job opportunities and vacancies for the poor, even the scholarships are too limited to be accessed. Educational standards are fleeting and rising every day. Therefore things should be simplified for all and sundry, so even by sitting at home one could login to web for studies and educational purposes. Such resources are like magic out of the blue and we all should support these initiatives that serve the students and teachers globally online. 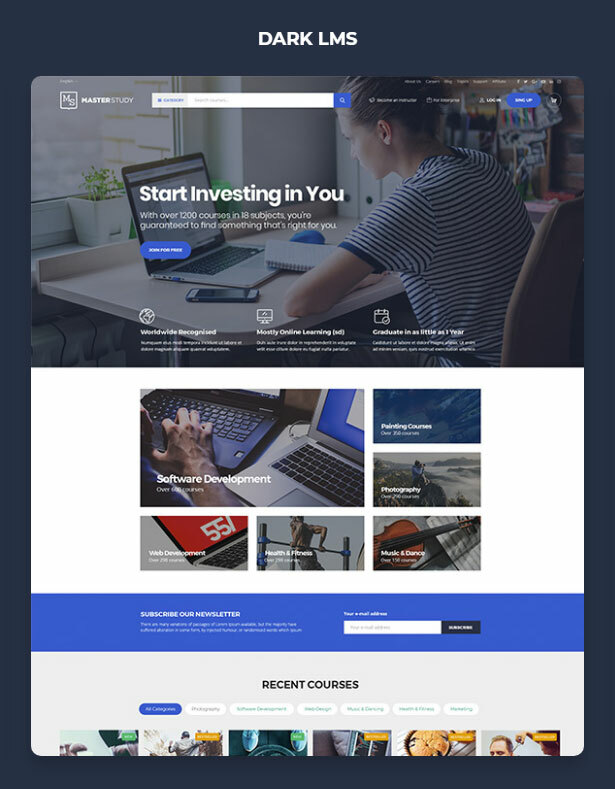 Since our blog defines and gives clear implications about WordPress themes, here we would like to draw your attention towards this MasterStudy Revolutionary Learning Management System WordPress Theme which is SEO compatible, where online quizzes, assignments, tutorials, courses, teacher training, academic sessions, E-learning, personal development courses, learning strategies etc. can be created and emphasized. 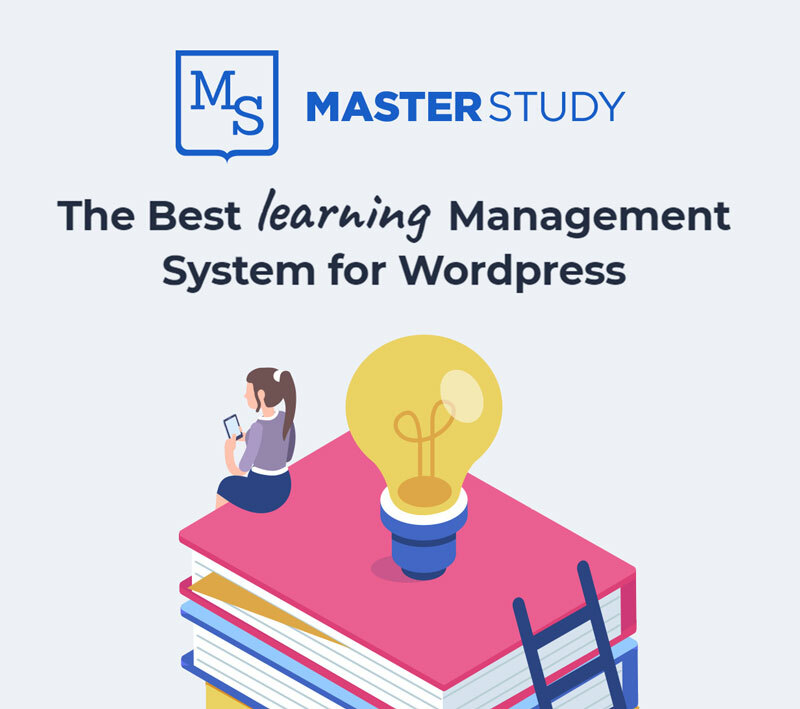 MasterStudy Learning Management System WordPress theme is very simple yet professional theme that has options to customize several premium features. 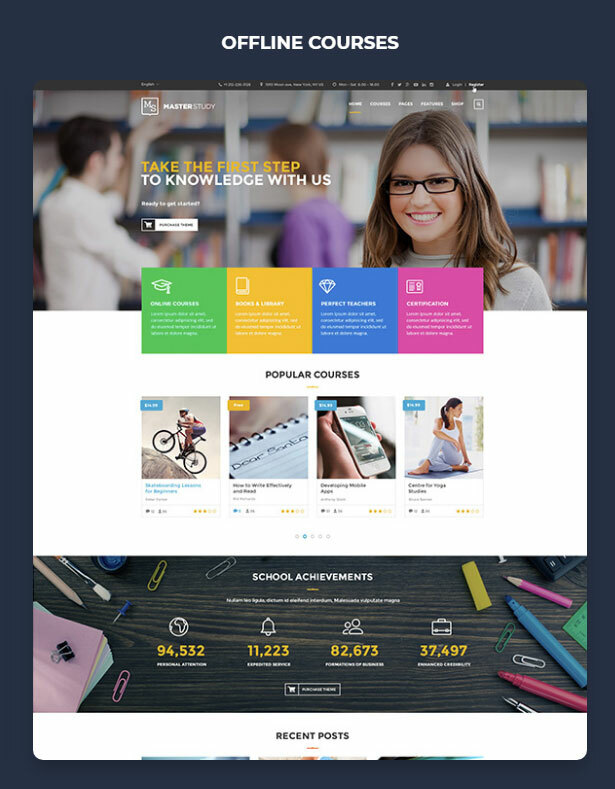 Anything related to study and academics can be easily uploaded in few steps, add whatever color or background you like according to your wish because this WordPress theme is readily customizable and too flexible to adjust itself in one’s demanded frame. 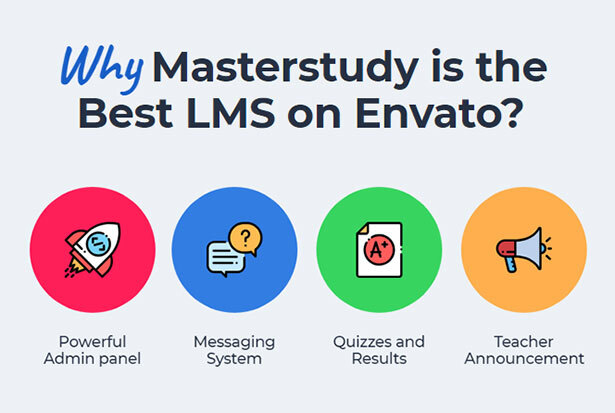 MasterStudy Learning Management System WordPress theme is the best of all LMS at Envato. What makes MasterStudy Learning Management System THE BEST? On MasterStudy LMS, any quiz, education criteria, programs and courses can be setup for the students, it is the easiest way to go about things. 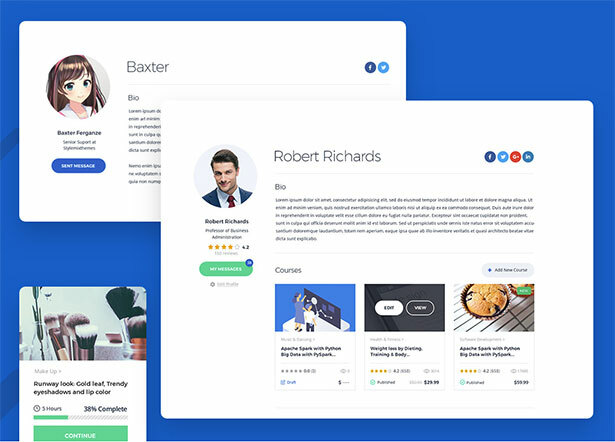 This theme is said to be the best because of its responsiveness, powerful admin panel, messaging system, quizzes and results and teacher announcement. Admin Panel: It has the powerful admin panel which is also simple & easy to be operated by the admin(s). Offline courses: Many offline courses can be created with comprehensive details so students can seek guidance from it and learn the courses at the most convenient time of the day. There are unlimited chances and opportunities for the students to avail so they come out with flying colors. Students can easily locate current/recent/upcoming courses and can get benefits out of them uninterruptedly. Payment Solution: Courses can be sold easily; with a very easy integration of PayPal and Stripe. Use Paid Membership Pro to sell courses via subscription or student membership. 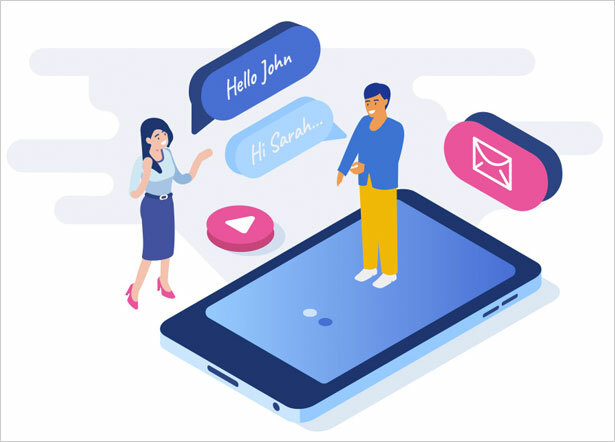 24/7 support: There is a live chat feature where any query can be sought after immediately, removing all ambiguities and problems faced by students. How lesson can be created on MasterStudy Learning Management System WordPress theme? Different images, graphs, pictures, videos and slides can be added to make lesson plans for the students. The lesson plan and management tool is utilized to create user-friendly lessons for the students. One can easily locate a part of lesson through Search by Lesson. Even the progress can also be seen on this theme’s user-friendly interface. The font size can easily be customized within the lesson, make it bigger or smaller the way you want. MasterStudy Learning Management System WordPress theme has integrated a plugin. Many thanks to Vue.js. Life is sorted. In every lesson there is a very fine ‘questions’ module’ where students may ask questions and get their answers instantly on quick prompts or they can also slog through the FAQ. 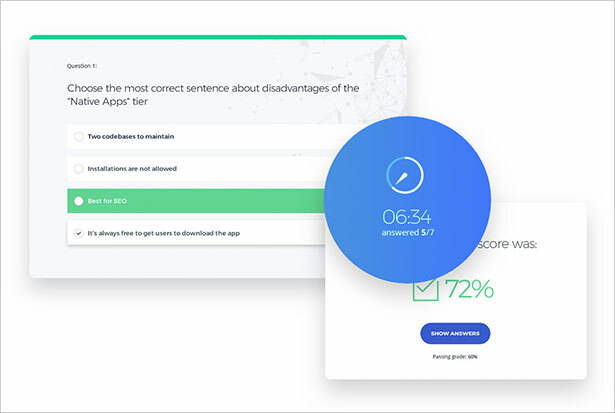 Multiple choice questions, quizzes, true/false, single answer (open-ended/closed-ended) questionnaires are made and those too with time-lapse so students may asses themselves in a better way. The instructor bio can easily be read out and accessed through his/her profile page where the bio and details of the instructor is written. The same goes with the students, their profile page and their opted courses can be accessed and seen. It is basically there to develop a huge educational network so “approach and access” could become easier. Messages, any important notices and announcements and two-way communication has become possible to keep in tough and upgraded with latest news and statements/reports in this Learning Management System WordPress theme. Custom 1-Click Demo Import: Install you prefered demo in few clicks and all required plugins are another click away. Most easiest way to start quickly, isn’t it? Advanced Theme Options: Now you can use Theme Options to change and customize all areas of your site, without touching the code. What would you want other than this? Also, you can customize your site using Google Fonts, Standard Fonts or upload your own font. 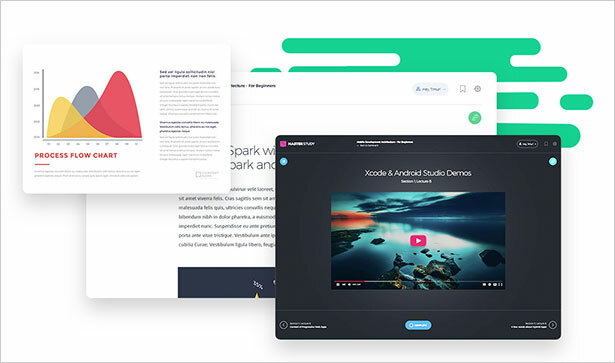 Loading Speed Optimization: Masterstudy has been optimized for speed, with perfect page loading score on, GTMetrix, Pingdom, YSlow and Google PageSpeed. Multilingual & Translation: Masterstudy is 100% WPML compatible, so you can use the WPML plugin to translate your website into any language. 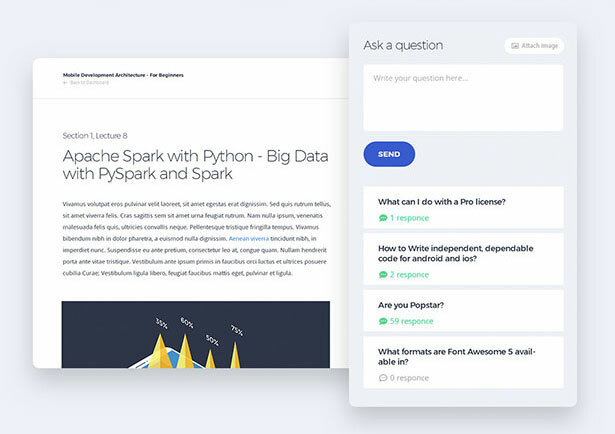 In short, you may easily publish your learning courses with all the relevant materials for the students, this theme will help you manage all the stuff on fingertips. 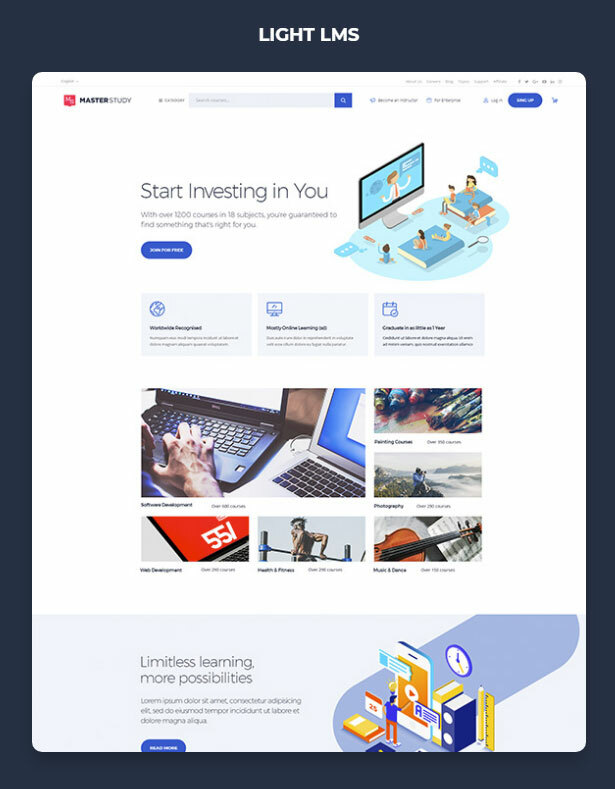 Masterstudy is created as a Learning Management System for Courses Listing Platform like Udemy, Training Center, Courses Hub, eLearning Business, College, Academy, University or School. It is the best and foremost solution for online education business.